For a majority of the season, the Avalanche has been labeled a one line team—and rightfully so. Star centerman Nathan MacKinnon and linemates Gabriel Landeskog and Mikko Rantanen took the NHL by storm in October, scoring at will on some of the best teams in the league. 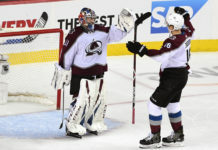 Rantanen’s surge saw him sit atop the NHL scoring for over a month in the early portion of the season, while Landeskog has reached 30 goals for the first over his eight year career. 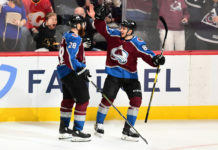 While Rantanen and Landeskog have enjoyed career seasons, and MacKinnon is just three points away from following suit, the Avalanche has enjoyed a much-needed jolt of offense from the rest of its lineup during its most recent 10-game stretch (7-2-1). Of the 12 forwards that suited up against the Arizona Coyotes on Friday, every single one has scored over the past 10 games outside of Landeskog and depth forward Matt Nieto, both of which recently returned from injuries. Colorado has scored 26 goals over this stretch of games, well below its 3.16 goals-per-game average over the entire season. But aside from MacKinnon’s five and Rantanen’s two, depth forwards Gabriel Bourque, Derick Brassard and Sven Andrighetto have each scored twice, while J.T. Compher, Tyson Jost, Carl Soderberg, Alexander Kerfoot, Matt Calvert and Colin Wilson have one goal each. The group of forwards outside of the big three have accounted for three of Colorado’s six game-winning goals over this stretch, with the shootout victory on Friday being the seventh. 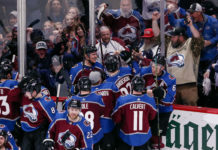 Head coach Jared Bednar has managed the losses of Landeskog and Rantanen well, sometimes playing seven defenseman to give MacKinnon an opportunity to play up and down the lineup. With two-thirds of the top line missing a portion of games, the extra ice time has been spread across the lineup, three players in particular getting a chunk of the minutes. 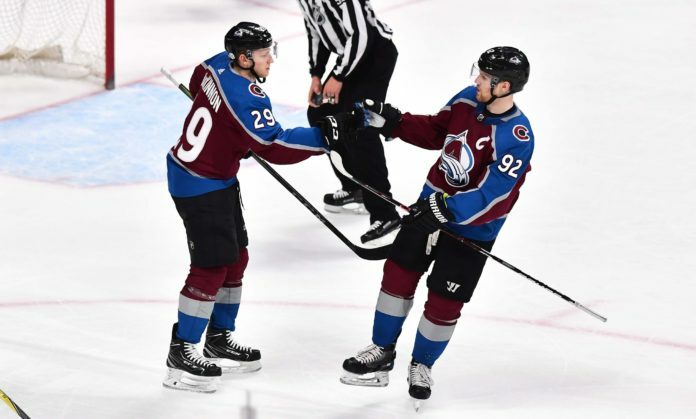 Compher, who has just one goal and one assist in his last 10, has played with MacKinnon regularly. His strong forecheck and ability to play below the goal line has seen his ice time jump to 20:34 per game, well above his season average of 17:21. Kerfoot has also seen a three-minute jump in his time-on-ice, playing 17:36 per game and recording five points during this stretch mostly on the wing with MacKinnon and Compher. Soderberg has been Colorado’s most consistent scorer outside of the big three all season long. While he may have just four points over his last ten games, it’s his penalty-killing capabilities and defensive zone starts that continue to make him a valuable asset to Colorado’s top six. His ice time has jumped over two minutes to 19:40 per game. Not to be ignored, the offensive production from the blueline has played a large role in Colorado’s recent stretch as well. Tyson Barrie has scored five goals over the past ten games, while Ian Cole and Erik Johnson each have a goal. But if Colorado has any chance against it’s first round playoff opponent, who at this point looks to be the offensively powered Calgary Flames, the forward lineup will need to take shape and build chemistry heading into a probable second straight playoff appearance. Perhaps the most important takeaway from this stretch of games is the formation of what could be a respectable top-six heading into the playoffs. With Landeskog back and Rantanen’s return probably for the playoffs, Colorado could have its big three along with Soderberg, Kerfoot and Compher playing on the top two lines. And with the Flames currently sitting fourth in NHL scoring, the Avalanche will need all of its top forwards to show up offensively. The Avs continue their playoff push on the road at 6:00p.m. MST on Monday against the St. Louis Blues.